Tired of breakfast yet? Me neither. I mean...yes, waffles. Again. But they're a different beast altogether than the buttermilk waffles were. Well, maybe not entirely different. They are waffles and they also use buttermilk. Hmmm. What was my point? My point was that I can't get enough breakfast food and these waffles are an awesome contribution to the breakfast, brunch...heck, dinner...table. The waffles themselves are crisp on the outside and a bit chewy on the inside from the cornmeal. The blueberries add the the "blue" I was hoping for with the blue cornmeal. The thing is, they're actually not sweet. There's just a touch of brown sugar in them, but not enough to make them seem like a sugary food. No worries, though...once you pour on the hot maple syrup, they'll be plenty sweet enough to satisfy that urge that made you want waffles for breakfast...yet they won't overwhelm those who don't dig sweet first thing in the morning. ¼ c. melted butter, cooled to room temp. Mix all of the dry ingredients together in a large bowl. Whisk the buttermilk, eggs, and butter together in a separate bowl. Gently fold the wet into the dry and then fold in the blueberries. Preheat your waffle iron according to package directions and scoop batter (mine goes by ¼ cups). Cook until golden and crispy outside and cooked all the way through. You could also make these in a belgian waffle maker. 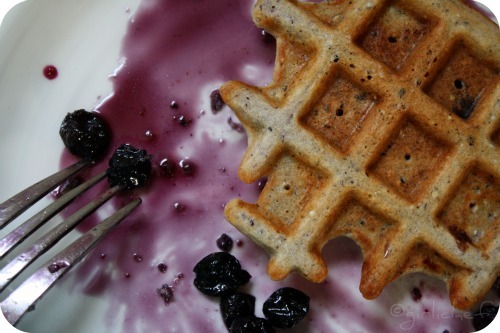 These waffles are not sweet on their own and benefit from some good maple syrup and/or fresh fruit toppings such as blueberries, strawberries, or sliced bananas. I made a simple Blueberry Maple syrup that I thought was perfect with them. Make as much as you need by doubling, tripling...or halving. Just keep the syrup to blueberry ratio the same. Combine in a small saucepan and bring to a boil. Reduce heat to a simmer and cook for ~10-15 minutes. Blueberries will soften and burst to turn the syrup a beautiful blue color and the time will allow the two to combine and let some of the water from the fruit to evaporate. Should be the consistency of syrup again when ready to serve. Although they'd no longer be meatless, these would be awesome with some cooked bacon crumbled into the batter, as well. Unos gofres muy diferentes y ricos. 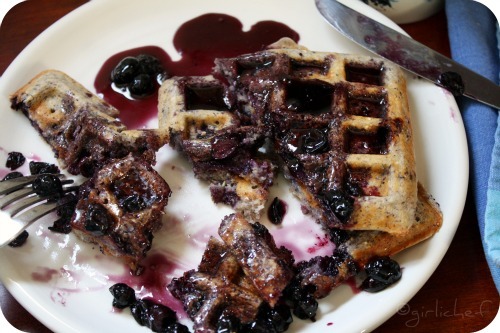 wow...these waffles look ssoooooooooooooooooo yummy ! I am a huge breakfast fan and these look amazing! I spotted some blue cornmeal just the other day and I KNEW I should have picked it up! I could never tire of waffles. ever. Especially not ones as delectable as these! I wouldn't complain about waffles "again," especially ones like this! heather...have i mentioned yet that i love your new blog header? if i have, consider it a double love. 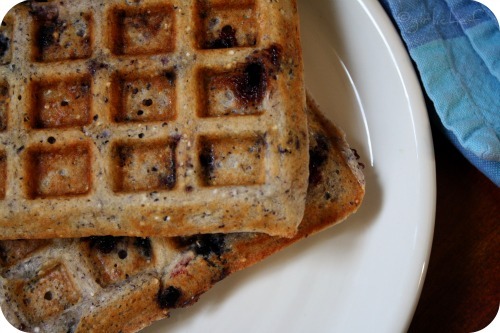 oh how i wish i had a waffle iron...these look too good to pass up. who doesn't like sweet sweet in the morning...let me at 'em! I could never tire of breakfast! This sounds like an absolutely delicious dish to eat any time of the day or night! 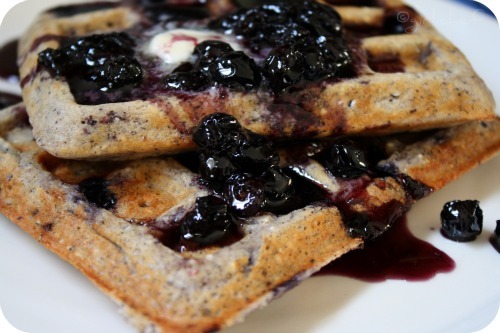 I like that you carried the blue all throughout - from the blue corn to the blueberries in the waffles and the syrup. Fun, healthy, and delicious - what more could you ask of your breakfast? No, not me....I'm not tired of breakfast! Good one...the blueberries are wonderful, the color of them leap off the page. Delish! I have a bag of blue cornmeal in my freezer right now--this looks like a great use for it. (of course that means digging out the waffle maker I have never used!) 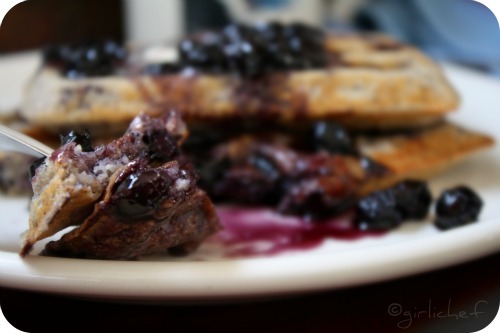 ;-) Loving all the blue and blueberries--yum! Hmmm!Makes me want to reach out and try them out. How can we be tired of breakfast with so many options you had posted lately. I was even wondering if you were pregnant :) . You had been posting so many yummy recipes for the early risers. Am I blue? No way, not with this creative treat of a breakfast. Really looks fab. Oh my goodness, these look wonderful! I just love blueberries, and the cornmeal is such a cool addition. I've finally got a waffle maker, and these are first on the list for trying it out! these are so freakin gorgeous, a perfect breakfast! Awesome, delicious, yummy what else I can to this kind of breakfast. Sick of breakfast? Never. And why not have this for dinner, too? I'm game. I love that they're not sweet - that's what those luscious toppings are for! Looks like a labor of love, but so worth it! Gorgeous photos! And very appealing recipe. Really enjoying your blog. I love waffles. We make them quite often and try different variations all the time. Some using bran flakes, whole wheat flour, Greek style yogurt along with many others. But You have me very excited to try them with corn meal. I just made biscotti with cornmeal(they were soo delicious) and I'm kind of on a corn meal kick. Who cares that we had waffles 2 days ago. There's always supper to think about, right? Can't wait! I will report back! I love breakfast, just usually at dinner time :) These look amazing! These look great. I'm trying to play catch up so I get to see all your goodies at once! Blueberries are a great antioxidant. Yum... looks like dinner tonight. Those. Look. Incredible. 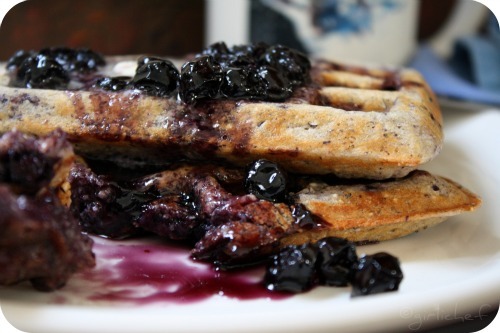 I love making blueberry pancakes but now I'm dying to try this recipe- I haven't used blue cornmeal before but it sounds intriguing. 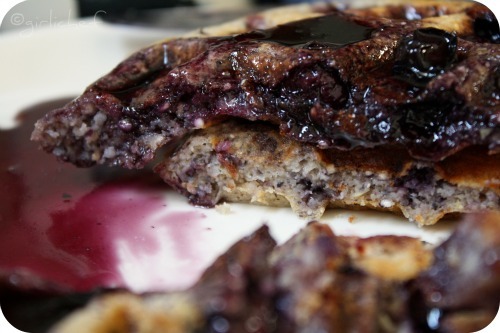 And I am definitely going to make the blueberry maple syrup to go on top...or blueberry compote would be good as well?